Turkey are enjoying themselves in the U20 youth international basketball in Noia. They will take the winner's trophy home no matter what happens in their final match after seeing off France (65-59). Spain needed overtime to beat Russia (67-65) in the second match of the day. As exciting as the match was neither coach was really satisfied with the performance. Spain's rebounding was not good while Russia's shooting was terrible. Yet the players' passion made up for their shortcomings. Spain had the better of the first 20 minutes and led (31-28). But their failure to take care of the ball (turnovers) and poor rebounding allowed Russia to stay in the match and take the game into overtime. 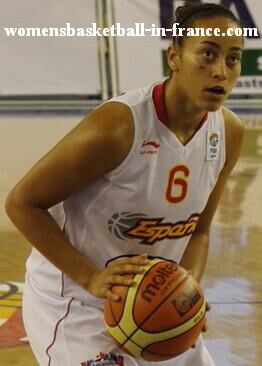 Inma Zanoguera (in picture) who attends Toledo University was the match winner for Spain with 21 points. She was helped by Yurena Díaz who scored 11 points. For Russia Galina Kiseleva led the way with 15 points while Ksenia Tikhonenko chipped in 12 points. Turkey were fast and aggressive. By winning most of the hustle plays during the first 20 minutes they opened up a 14-point lead. France were much better during the second half of the match. Under the impulsion of Marie-Bernadette Mbuyamba her side rallied back. However it was not enough to stop Olcay Gakir (17 points) and Turkey from winning the match (65-59). Turkey have already won the tournament because of their victory against Spain on the opening day and due to the fact that Russia, their final opponents, have not won a match. France and Spain will meet in the final match with the winner taking second place. Many of the players on the two rosters had faced each other in 2012 during the quarter-final of the U20 European Championship for Women with Spain winning (55-53).